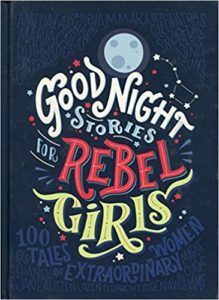 From Frida Kahlo to Jane Goodall, from Coco Chanel to Nina Simone, from the Bronte sisters to Marie Curie… this book tells the stories of the extraordinary lives of 100 brave women. Scientists, astronauts, weight lifters, judges, chefs, singers, artists, sportswomen, politicians, queens, writers… 100 examples of determination and boldness for the children who dream big. This collection is certainly an interesting, amazingly and very well illustrated book (a different illustrator for each famous personality). It also had the merit to popularize the issue of girls’ empowerment and make it visible out of the gender ghetto. However, some biographies are problematic and some choices questionable (e.g. presence of controversial personalities like Margaret Thatcher; portrait of Virginia Woolf). Moreover, the presentation of issues is sometimes simplistic.